1. Think about what matters to you. The first step to a successful campaign is to have a cause and idea that people can get behind. It’s important that it’s something you care about a lot, as it’s so much easier to push for change if it’s something you genuinely believe in and can demonstrate passion for. Your cause can be a local or national issue, it might only affect a few people or a lot, but this is your opportunity to drive for change! 2. Research what is already being done. There are thousands of charities, organisations and individuals who want to change the world, so make sure to do a bit of research to see if there’s anyone else working to achieve something similar – you might be able to get involved. Be sure to check petition websites, like change.org or the Parliament Petitions website, as well as taking a look at what campaigns relevant charities or pressure groups are currently running. 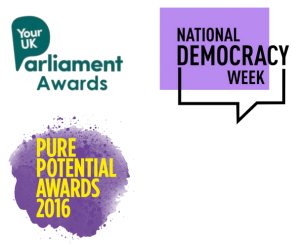 You can also see what MPs have said about your issue in Parliament by searching the topic here. Getting involved with a larger group can sometimes give you more leverage for achieving your end goal. They might already have ongoing campaigns that they need support on, so don’t hesitate to get in touch and offer some help! Equally, if your campaign is unique then great! It gives you the opportunity to shape the outcome more directly. 3. Think about what action you want to achieve. This is very important, the best campaigns have a focused vision for what they want to achieve. For example, if you care about removing plastic waste from the sea, your campaign objective could be to get supermarkets to commit to reducing their plastic packaging bu at least 30% by 2020. Your own campaign might also seek to actively change the law, or it might be as simple as raising awareness or money. Once you have an objective its much easier to plan the rest of your campaign. Try to think about what your fellow citizens, organisations, Councillors, or MPs could do to help the cause and work from there. The next step is to design a campaign that will help you reach your goal. You need to think about what the best way to achieve your objective is and what tools you can use to help you. As we mentioned, there are lots of different tools you can use to help you, it’s a good idea to think about how each of these tools might help your campaign. Petitions are a great way to show you have support for a cause, they involve getting as many people as possible to sign up and say they agree with what you’re trying to achieve. You can run a petition online or in person, it just depends on what is appropriate for your campaign. When designing your petition remember who it’s aimed at, it could be to your headteacher, local Councillors or MP, the CEO of a company, or if you’re looking at legislative change you might address it to the Prime Minister or Government. Websites like change.org allow you to choose a target a particular person or organisation with your petition, or if you want to see your issue debated in Parliament, you can use the Government & Parliament’s petition website. Your representatives are also a useful tool to help achieve change, consider sending a letter to your local Councillor, MP, or even MEP, which lays out your campaign. You can even ask to meet with them to discuss it further. You could go further, if your issue is national (or even international) you could always write to the appropriate Government minister (find them here) or find a group of MPs that support your cause. Remember to always think about who your issue is relevant to. If you’re campaigning for more bin collections, you’ll need to speak to your councilor, but if you’re looking to increase Government spending on schools you might need to speak to your MP or the Minister responsible for this. You can also use marketing techniques to get support for your campaign. For example, if you’re running an anti-bullying or mental health awareness campaign in your school, you might want to design posters that tell people where they can find help. Remember to always ask permission before putting up posters, if its for a good cause you’ll often get permission easily. What makes my story interesting? You can often find journalists via twitter or directly through news websites. Remember to make your story interesting, now is the time to show your passion for the subject! You can also use social media, such and facebook and twitter, to help build support for your campaign from the general public, you might also attract the attention of some journalists and media by being active! One way to build a compelling argument to support your campaign is by running a survey, or doing some interviews, to find out people’s viewpoints and experiences of your particular issue. This way you can compile evidence to support your campaign. For example, you might interview local residents about how much they use the local library and the support it provides, in order to help the council appreciate its importance and prevent it from being closed. Once you’ve completed your research you can collate your findings into a report, and explore how your results correlate with existing research by other organisations. You could submit this report to the local council, a Government department or even a relevant select committee. There are plenty more things you can do to help your campaign, can you think of some more? Get in touch @VotingCountsUK! 5. Get people involved and spread the word. Now this is the exciting part! Once you’ve got your campaign all planned out, you’re ready to announce it to the world! Start by getting a few of your friends and family on board and go from there, use social media to reach more supporters. Remember to keep focused on your goal, it might not always come quickly or easily, but don’t lose hope!